Foreign policy success or failure is often attributed to the role of leadership. 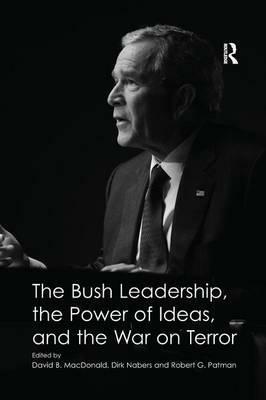 This volume explores the relationship between President George W. Bush's leadership, the administration's stated belief in the power of ideas (and the ideas of power) and its approach to the war on terror. Drawing on the international expertise of ten American foreign policy and security specialists, this incisive and timely book combines theoretical perspectives on political leadership with rigorous empirical analysis of selected aspects of the Bush administration's post 9/11 foreign policy. As a result, this book sheds considerable light not just on the limited impact of President Bush's war on terror strategy, but also, more importantly, on why key ideas underpinning the strategy, such as US global primacy and pre-emptive war, largely failed to gel in a globalizing world. Contents: Introduction: the Bush leadership, the power of ideas and the war on terror, David B. MacDonald, Dirk Nabers and Robert G. Patman; Globalization, the post-Cold War era, and visions of US leadership, Robert G. Patman; Historical analogies and leadership in Bush administration foreign policy, David B. MacDonald; Identity construction in US foreign policy during the Bush years, Dirk Nabers; George W. Bush, Iran and the squandering of America's soft power, David Patrick Houghton; Unilateralism across the border: the US-Mexico relationship, David Lebow and Richard Ned Lebow; Rogue policy: Bush and Iran, Michael Rubin; Bush's legacy and Obama's conception of American leadership, Nicholas Kitchen; Domestic politics and US leadership after September 11, James M. McCormick; 'Can't anybody here play this game?' America's post-Cold war leadership and the Bush doctrine after 9/11, Martin N. Stanton; Conclusion: power and ideas in the Bush era, David B. MacDonald, Dirk Nabers and Robert G. Patman; Index.